The Sea Master 400 (SM 400, known domestically as SMILE radar) is a multifunctional, non-rotating, four faced volume search radar for naval use. 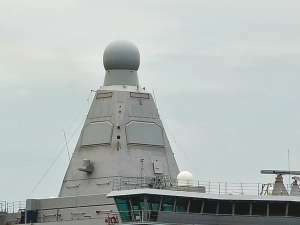 The radar is designed by Thales as a successor to APAR to provide air surveillance, helicopter control, surface surveillance and weapon control functions simultaneously. It operates in E/F-Band and incorporates aspects of the proven APAR and SMART radars. The radars unique concept of multibeam volume search with four active phased-array faces ensures the simultaneous performance of all operational tasks at a high update rate and practically zero false alarm rate. It has been designed to detect littoral targets that are difficult to detect by a typical rotating radar thanks to its inherent longer time on target.